Why was I thinking about Cream all night? The guitarist didn’t play like Clapton. The bass player didn’t sing, and the drummer wasn’t doing bass drum rolls. There was not a blues lick to be heard, and the group is not from England. In fact, A Love Electric comes from Mexico City! Still, this trio played with the musical interplay and intensity found on Wheels of Fire. The group’s comfort level with each other might be partially explained by this Milwaukee date being the last of a world tour-one that had them gigging in Frankfurt and in Fargo during the same week! But far from appearing exhausted, the group sounded invigorated throughout their three long sets. Most of the night consisted of stretched-out material that occasionally threatened to fall into musical chaos. But just as a breakdown appeared eminent, it became obvious that the players always knew exactly where they were. They were so tight that they could feign a looseness that bordered on harmonic anarchy, consistently reemerging in perfect unity. Aaron Cruz’s electric five-string bass frequently had the fat tones of Stanley Clarke, with a popping stylistic approach that also echoed this fusion master. Reminiscent of Jack Bruce, Cruz often played intense yet melodic bass lines against a counterpoint lead guitar solo. This can run the risk of becoming too busy, but the intricate bass playing was always logical and tasteful. Cruz also incorporated clearly executed harmonics that rang like bells on several pieces. The rhythm section of Cruz and drummer Hernan Hecht was locked in a groove on each number. Like the bassist’s occasional flurry of notes, Hecht gave a lot of percussive background to the soloists, but at no time was he showy or disruptive; his playing always fit the tune. 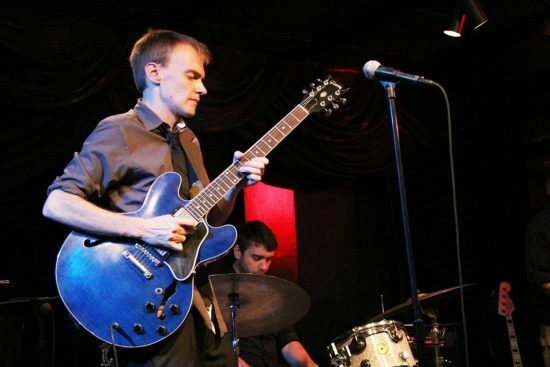 Group leader Todd Clouser sometimes flailed with abandon at the fretboard of his blue Gibson 335, providing a bed of sound over which another band member soloed. He also played well-executed lead lines and lots of straight rhythm patterns. With its generous leader, the group never seemed anything but a collective of three equals. Clouser sometimes used foot pedals to evoke various sounds, including synthesizer tones. Mostly, though, he played the instrument without external effects, getting the notes he was after by picking and bending strings. In fact, at one point Clouser bent his low E string all the way around the back of the guitar neck to create the sound he wanted. The guitarist was no stranger to purposeful distortion on his instrument. Perhaps this is why one of the rare non-originals covered by the band was a hot instrumental take on “Manic Depression.” Hendrix influences occasionally surfaced in Clouser’s playing, but never in a straightforward imitation. At other times, the guitarist sounded like he had been studying Howard Roberts’ experimental Equinox Express Elevator and Antelope Freeway albums. This made for an interesting and varied evening. Instead of the usual high-octane closer, the group was confident enough with its music to end its first set with a ballad, “Break in the Morning.” The second set began with two instrumentals, including “Without a Face.” Most of the pieces had lengthy and intricate heads, on which the musicians never faltered. After these two slower numbers the band kicked back into high gear as the music continued to meld from one tune into the next without interruption for over 40 minutes. Stylistically, it was reminiscent of a late 1970s live set of flowing material by the Grateful Dead. At a few points, the group incorporated vocals. On “Your Money’s No Good,” Clouser sang the solo guitar lines as he was simultaneously playing them, conjuring a young George Benson. More often, intentionally non-melodic spoken narratives were placed over a textured vamp. One selection about time spent in Chicago worked well, as did another that had the unsettling refrain, “Mr. Kahn scratched his ticket.” Clouser’s delivery combined Tom Waits’ Nighthawks at the Diner style with Ken Nordine’s “Word Jazz.” These vocal numbers did show admirable diversity but of the some spoken pieces were more successful than others, and microphone problems didn’t help the performer. But even without this technical impediment, A Love Electric shone brightest on their instrumentals. That previously mentioned power trio from England performed as a group for less than three years. Todd Clouser and A Love Electric have been playing for that same duration but sound as if they have been together a lifetime.